'Hottest ever' SL unveiled | What Car? Mercedes is set to add a new hot model to its revised SL range. 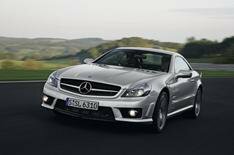 The SL63 AMG has a 6.3-litre V8 engine which will produce 525bhp. This will power the car from 0-62mph in just 4.6sec and on to an electronically limited top speed of 155mph. There's a new gearbox, too, called the AMG Speedshift MCT 7-speed sports transmission. It is unique to the SL 63 AMG, and is able to change gear faster than transmissions in lesser SLs. Sports suspension, a Race Start function and a high-performance braking system will also feature. For those more concerned about aesthetics than performance, the drop-top will certainly have a presence on the road, thanks to the AMG bodykit and aggressive styling. An optional 'Airscarf' neck-heating system is also available for when the roof is down. You won't have to wait too long to get your hands on the revised SL - it will hit UK showrooms this April. Pricing will be announced then, too.